What do you give up when the world gives out? 40 is a thrilling post-apocalyptic drama. Seven strangers appear to be the only survivors of a mysterious, calamitous event: Los Angeles is empty, devoid of people. No sign remains of family, neighbors or coworkers. No space ship hovers over the city, there are no zombies or flesh-eating viruses. Just seven strangers, who share the same iridescent blue mark on the shoulder, a tiny, precise square of color that wasn’t there yesterday. Were they chosen? Or have they been culled? By whom? For what purpose? Their search for answers leads the seven to an even greater mystery. Why do they suddenly feel compelled to leave the safety of the city for an unknown destination? And why does the number 40 exert such power over them? Why are they being drawn towards whatever 40 represents with such compulsion, such longing? 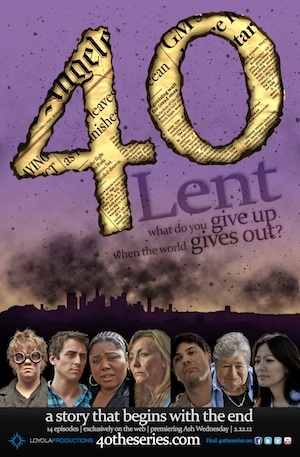 40 is also a Lenten allegory. 40 can stand on its own as a rewarding viewing experience. Because it’s structured as a Lenten allegory, 40 also provides fertile ground for prayer, conversation, meditation and study. Exile and journeying, loss and grief, hunger and thirst, mortification and fasting, sin and redemption, the path through the desert and the way of the Cross—all are dramatically “mirrored” by the story unfolding onscreen. 40theseries.com provides access to “what’s beneath” each episode. Click on “Reflections” and you will be presented with a wealth of commentary, scriptural references, prayers, poetry, prose and music, specially curated by the writer and producers to augment your experience. 40 is an innovative tool for observing Lent. Download episodes on your home computer for family viewing. Catch the latest episode on your Smartphone during lunch. Explore the wealth of supplementary material at your own pace or use Twitter and Facebook to share your insights with friends. At home, at work or in the classroom—40 is the perfect compliment to your Lenten experience.